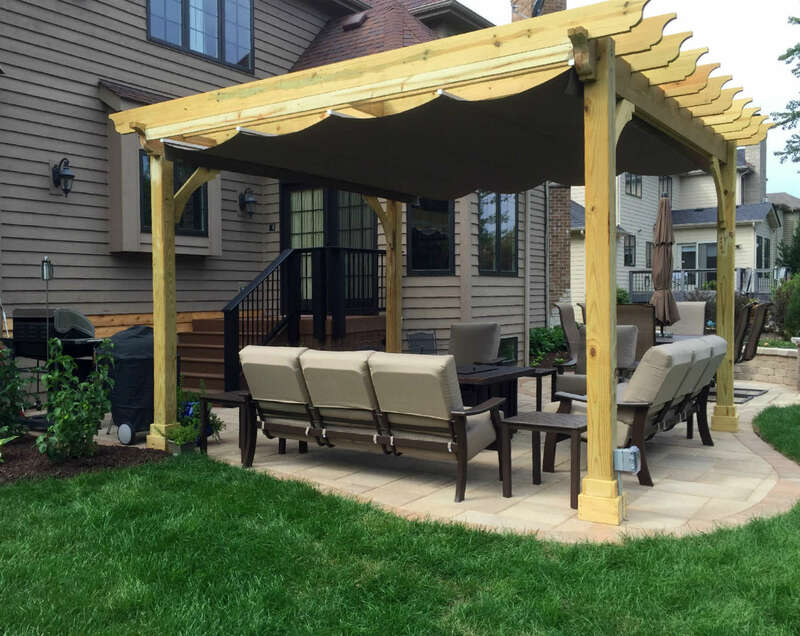 Archadeck has been building outdoor living structures in Naperville and throughout the Chicagoland market for over 25 years. 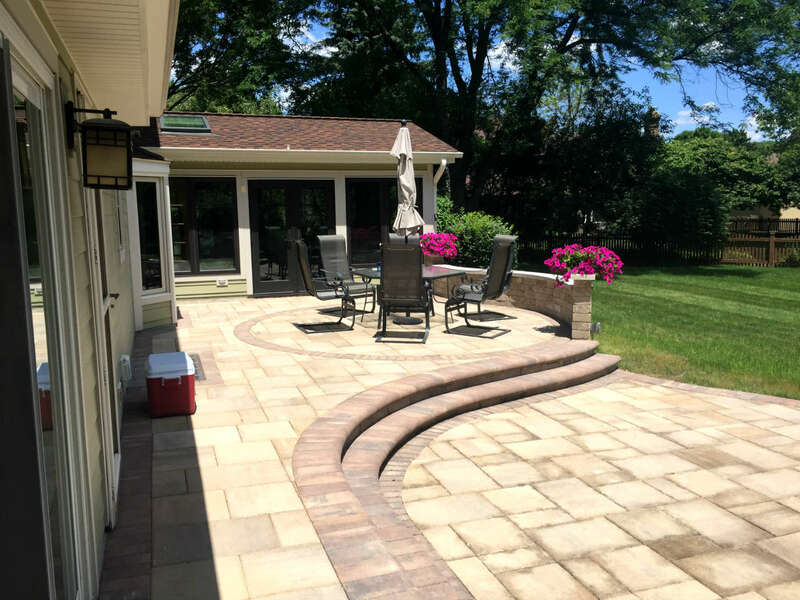 If you’re looking for a Naperville patio builder, look no further than Archadeck of Chicagoland. The seasoned design team at Archadeck has built patios in every size and shape imaginable and with many different materials. The patio above is a stone block patio using Belgard paver stones. The footprint of the patio is curved giving it dimension and visual appeal. Toward the far end in the picture is a vertical retaining/seating wall. 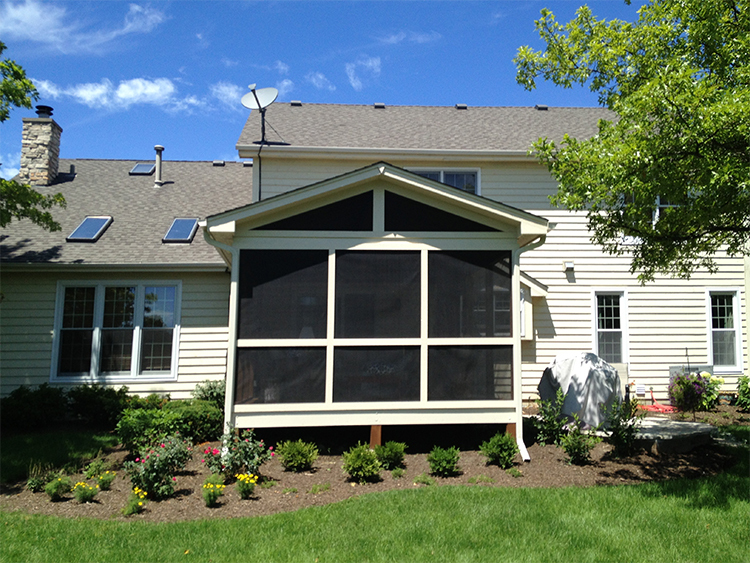 The pergola is topped with a lovely wood pergola complete with outdoor fabric to provide additional sun protection. The home picture above has a beautiful TimberTech low-maintenance deck with low-maintenance railing. 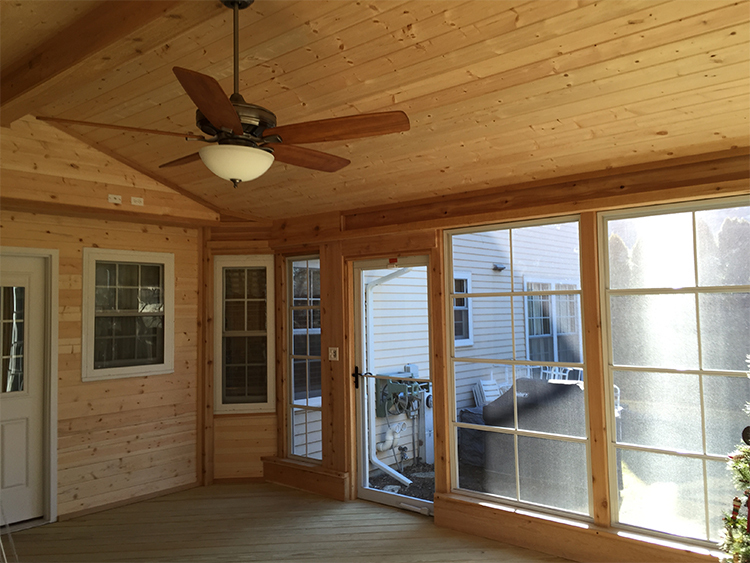 The deck is large enough to have 2 different outdoor living areas. One can be used for seating and the other for eating. The railing is a steel cable railing. This allows maximum visibility out into the yard along with an upscale industrial flair. The deck is finished with TimberTech composite wood skirting to ensure a completely finished look. Lighting is installed in the stair risers to ensure safe footing in the evening. 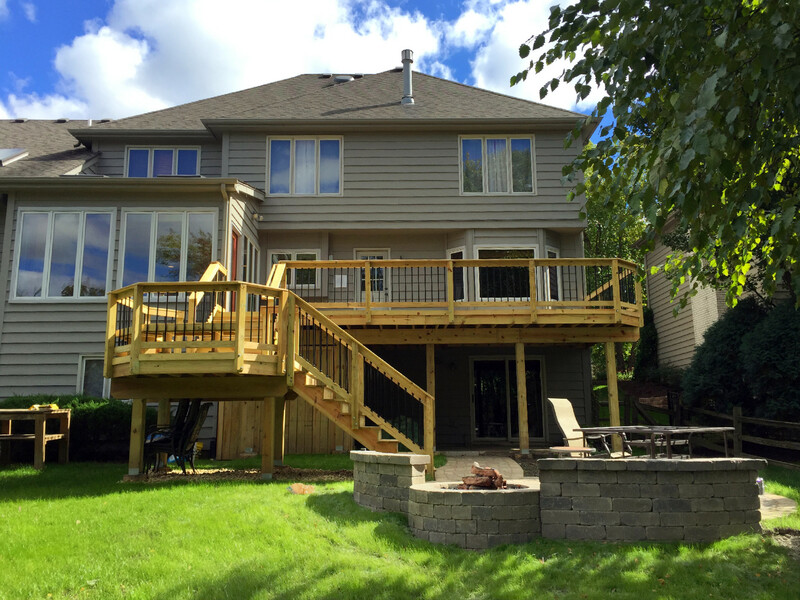 If you’re looking for a Naperville composite deck builder, we would love to work with you to design and build the perfect space for your home. The Naperville backyard featured in the photo above is truly an outdoor living paradise. 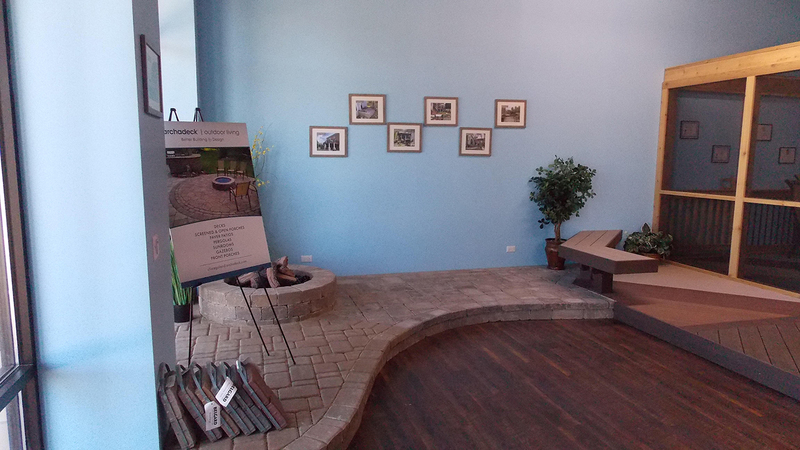 The new outdoor space includes a gable roof screened porch and a large multi-area Belgard stone patio. The patio not only has multiple living spaces but also elevation changes for even more visual appeal. The steps that connect the different levels can be used for overflow seating if you have a few more guests than expected. The retaining wall in the dining area of the patio doubles as seating as well! 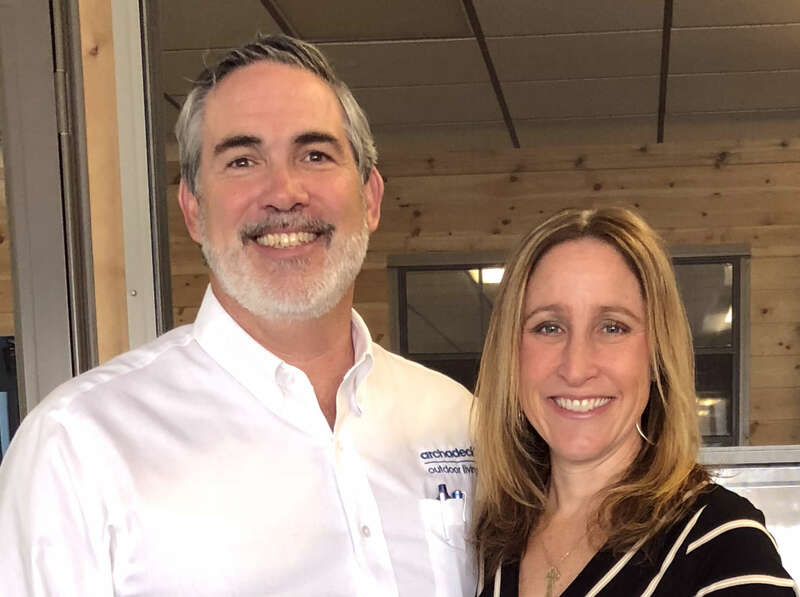 When you work with an Archadeck design consultant to plan your new outdoor living space, there are many decisions to be made about shapes, sizes, materials, styles and more. That’s why we built a design center here in Naperville. When you contract your new space, we invite you to take a look at different materials and work on plans together with Archadeck. More and more often, Naperville homeowners are choosing to build combination spaces. These spaces include 2 completely different outdoor living spaces that are attached and work together to complete the ultimate backyard. The home above has a multi-level elevated deck that steps down to a paver patio complete with a paver patio with built-in gas fire pit. One of the things we hear most often from homeowners is that homeowners don’t want their new space to look added on. We work very hard to ensure your new space looks original to your home. We take into account the roof shape and slope on your home, facade, paint color, trim color, gutter type and many other factors.